SG noticed a new color trend in town. Even though it's still cold and raining, I can't help but wishing for spring already. And, some window displays are already showing off resort trends which are delightfully fresh. Personally I am ready for some fresh spring colors. 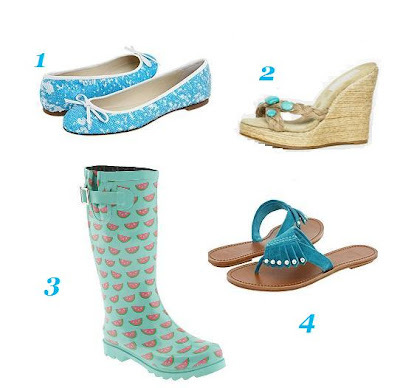 Unlike my favorite pink, turquoise provides a sense of freshness which is very sharp and cool. 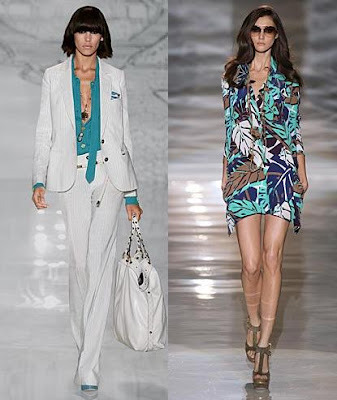 Gucci resort is showing quite a bit of turquoise at the show. If clothing are too costly, then adding accessories such as shoes, bags or a bracelet in the newest seasonal color will update a gal's wardrobe instantly. 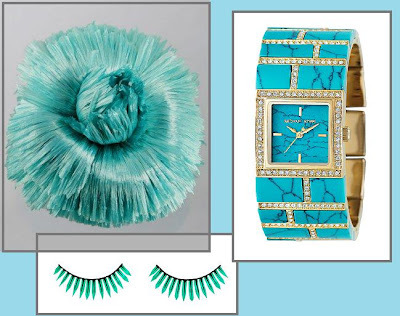 With turquoise you can go wild without looking like a Barbie. One of my favorite rings is my turquoise Xenobia ring -- it always looks cheerful. I love those eyelashes. That Herve Leger dress is amazing! So beautiful! It's so cold, snowy, and dreary here. Love these colors. Savvy, I replied to your comment on my blog, but I don't know if you will see it. I completely agree with you. the wealthy are hurting and losing money too. Houses are being forclosed on. I am making fun of the completely ridiculous statements about having to cut out strippers, mistresses, and not being as flashy, but still wearing tons of diamonds. Those are like "Let them eat cake" kind of statements, and are insulting to people who are legitimately having a hard time, wealthy or not. love it. 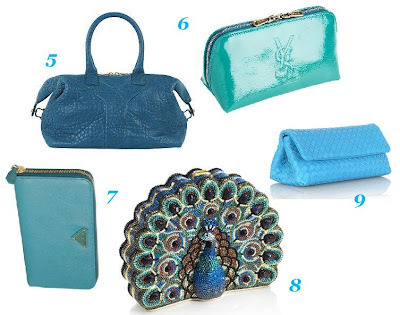 Turquoise always makes a comeback. I love it. I love how refreshing and interesting the colour is. It works with every skintone and everyone can pull it off. great post! I need 5, 6, 7, and 8 please! I agree turquoise color is great for all skin tones. It's fresh and very chic. Oh yes, it's a great shade of blue. Love turquoise. It's my favorite color. I love turquoise earrings. Herve Leger dress is quite fierce. I don't always like that label but that dress is tempting.